Steve Ballmer has been the CEO of Microsoft ever since he took over for Bill Gates back in 2000. Has any thing exciting and revolutionary happened for Microsoft (or its stock) since then? Not really… Things have gotten pretty stale at the software giant, and despite the notion that things have at least been steady, some want to point fingers at Steve Ballmer. This direct attack on Ballmer comes the day after IBM’s market value surpassed Microsoft for the first time in 15 years. And IBM isn’t the only company flying past Microsoft, Apple greatly surpassed Microsoft last year by capitalizing on the mobile market; something Microsoft has failed to accomplish. Is Steve Ballmer really to blame for all of these problems? Perhaps, but the bigger question is who could they find to replace him? Reuters originally covered and stated in and recently stated in an update that according to a “source close to the board” the nine-person board of executives at Microsoft stands behind Ballmer. Which, of course makes perfect sense with the timing. If the board showed anything other than confidence in the CEO of the company the stock would suffer tremendously. But, Einhorn has opened up a can of worms that has been sitting on the shelf of many investors minds for some time now, and there is no closing it back up. 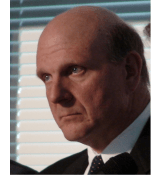 Do you think Steve Ballmer cuts it at as a Microsoft CEO? Do you think he will receive a premature replacement?